Jean-Luc Godard’s latest is a montage of images with the weight of an epic poem. Directed by Jean-Luc Godard. In English, subtitled French, and other unsubtitled languages. 85 min. Now playing through 2/21. Gene Siskel Film Center, 164 N. State, 312-846-2800, siskelfilmcenter.org, $11. Even when they trade in quotations, the films of Jean-Luc Godard exude a sense of spontaneity. The Swiss filmmaker has never been able to stay put on an idea or story line for very long; his work always goes off in unexpected directions or sprouts up non sequiturs. A possible explanation for the films' eccentric forms is that Godard has always embraced chance, coincidence, and arbitrary decisions as a core part of his creative practice. When he employs quotations (whether from written texts, movies, paintings, or musical compositions), he'll often do so because he simply likes how the sources look or sound. He also likes to name his films before determining anything else about them, letting the titles guide his ideas, motifs, arguments, and counterarguments as if they were watchwords or mantras. A dense and cryptic essay film in the vein of his magnum opus, Histoire(s) du Cinéma (1988-'98), Godard's latest feature, The Image Book, also began as a title and abounds with quotations both carefully and randomly chosen. It's a film that seems to be taking shape as you watch it—and in a sense, it is: Godard crams every moment with so much information that you can't possibly take it all in at once. You concentrate on certain details at the expense of others, constructing new audiovisual combinations each time you engage with it. (Your engagement will have a physical component if you see The Image Book in a theater. Godard designed the film's soundtrack for 7.1 surround sound, and he uses the format ingeniously—the sounds come at you from every part of the room.) I've seen it four times now, and it still feels fresh. Ironically, not many sounds or images of The Image Book are original. The montage consists mainly of existing movie clips, news footage, paintings, and printed words. One of the most imaginative editors in cinema, Godard sequences the materials in an ever-dynamic fashion, typically following up a shot with something completely different texturally. And since Godard manipulates his images in all sorts of ways—stretching them out, copying them off analog video equipment, digitally adjusting the colors—he has plenty of textures to choose from. In short, The Image Book is about making old materials new again, either through physical manipulation or juxtaposing them with other things. It's also—like Histoire(s) before it—about approaching cultural history as something like a graveyard. Godard strips his citations of their context, which has the effect of turning his sounds and images into phantoms; resisting ready understanding, they provide only traces of meaning. (All we know for certain about many of Godard's quotations is that they belong to the past.) The pileup of decontextualized culture results in an exquisite gibberish that often suggests adult speech as perceived by small children. 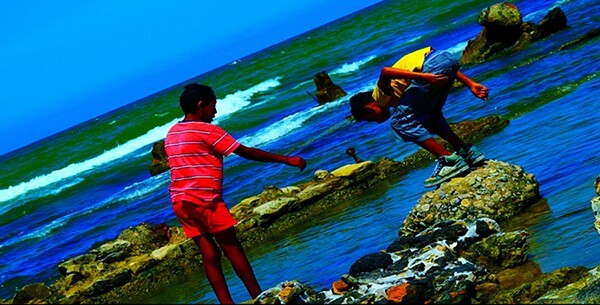 Not coincidentally Godard's collaborator, Fabrice Aragno, in a recent interview with Bomb Magazine, exhorted viewers to "watch the film like a child watches a cloud in the sky. . . . When a child sees this building meet that cloud, he can create something; that's what we're after. As adults, we're seeing too many doors and locks to create much of anything." It's also worth noting that one possible translation of the film's French title (Le Livre D'Image) is "the picture book." The narrative structure suggests something out of a book for children. It comprises six sections, the first five (which run about 45 minutes total) representing a person's five fingers and the last (which runs about 40) representing a hand. This form points to the film's overarching thematic question, which is one that a young child might pose: What's the difference between looking at the parts of a thing versus looking at the thing as a whole? The "finger" sections of The Image Book consider different aspects of modern life—some abstract, some concrete. Part one, "Remakes," touches on the possibility of humanity's self-annihilation, with shots of mushroom clouds, drownings, and jihadists committing atrocities in the Middle East. Part two, "Saint Petersburg Evenings," hovers around two interrelated themes, the corruption of political idealism and the ravages of war. Named after a line by Rilke, part three ("Those flowers between the rails, in the confused wind of travelers") centers around shots of trains and muses on technological progress. Part four, "The Spirit of the Laws," is about exactly that; here, Godard alternates between idealistic portrayals of legality (exemplified by an extended quotation from John Ford's Young Mr. Lincoln) and grim scenes of violence carried out by figures of the state (exemplified by an extended quotation from Peter Watkins's La Commune (Paris 1871)). The film's fifth and shortest part, "La Région Centrale" (named mysteriously after Michael Snow's 1971 landscape film), posits that the most intimate bond that one person shares with another constitutes the center of his or her world. This logic may seem contradictory, but then Godard has always thrived on contradictions—they're integral to his cinematic poetry. And The Image Book, which teems with contradictions, is above all a poem. Concerned neither with telling stories nor even making rational sense, Godard aims straight for lyrical beauty, and he almost always hits his target. The narration alone, which is consistently eloquent and provocative, would succeed as an epic poem. To cite a few lines from part three: "When a century slowly dissolves into the next century, some people transform the means of survival into new means. It's the latter we call art." Or from part six: "Every political ambition uses the excuse to pretend to sacrifice itself for the people's happiness, but the people have not asked you for anything; they just want to live in peace. And while in peace, the world is changing." These aphoristic statements, like Godard's open-ended movie titles, circle around big concepts without arriving at a definitive reading. Despite the seriousness of his concerns, the filmmaker still encourages a sense of play with regard to ideas. Correction: An earlier version of this review stated that part three of The Image Book took its name from a poem by Rimbaud. It is actually a poem by Rilke. Jean-Luc Godard has gotten less combatitve and more meditative in his old age.